Critics call President Donald Trump a diplomatic wrecking ball, while his supporters admiringly watch him take on foreign policy challenges that previous presidents chose to ignore or left to diplomatic "experts." Who's right? This week, the rubber meets the road. Trump's highly personal approach to negotiating with foreign powers -- while ignoring Congress -- is being put to the test by North Korea and China. Whether presidents should go it alone on foreign policy has been controversial since the founding of the nation. Even the Constitution's framers fought over the question. Midweek, Trump met one-on-one in Hanoi, Vietnam, with Kim Jong Un, the North Korean dictator he used to taunt as "Little Rocket Man." Previous U.S. presidents stood by while North Korea developed nuclear weapons and brandished them. This president, acting as his own chief arms negotiator, is taking on the problem. This will be Trump's second summit with Kim, following their June meeting at which the dictator promised to work toward the "complete denuclearization of the Korean Peninsula." So far, that's just an empty promise. Though, admittedly, North Korea has stopped nuclear testing and lighting up the sky with missiles. Trump concedes that "much work remains to be done, but my relationship with Kim Jong Un is a good one." Is Trump relying only on personal charm? Hardly. American economic sanctions are pushing North Korea into ever more desperate food shortages, and Trump has threatened to meet any North Korean aggression with "fire and fury." So, why not try diplomacy first, the president suggests. Unlike previous presidents, Trump is also confronting China's unfair trade practices and intellectual property theft head on. He slapped a 10 percent tariff on $200 billion worth of Chinese imports, and threatened to hike the tariff to 25 percent on March 1 absent a deal. While hitting hard with tariffs, Trump also praises China's chief negotiator Liu He as "one of the most respected men in all of China, and frankly, one of the most respected men anywhere in the world." At the United Nations last fall, he called President Xi Jinping "my friend" even while saying the trade imbalance with China "is just not acceptable." Career diplomats for years got nowhere with China. Trump's iron-fisted, velvet-tongued diplomacy seems to be working better. Trump would call it "the art of the deal." On Sunday, he tweeted that he'll delay hiking the tariffs because of the progress made so far in trade talks, and he invited Xi to meet with him personally at Mar-a-Lago in early March to finalize a deal. "I think President Xi and I will work out the final points." Meanwhile, Congress is on shaky ground trying to rein in Trump's "l'etat c'est moi" diplomacy. 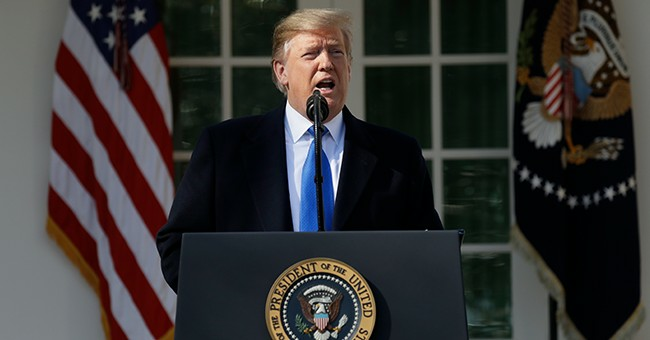 Rep. Tom Malinowski, D-N.J., and Rep. Mike Gallagher, R-Wis., introduced a bill to block Trump from withdrawing troops from South Korea, as part of any deal. Sorry. Deciding where to deploy troops is what the commander in chief does, not Congress. Check out Article II of the Constitution. Congress also wants to limit Trump's power over tariffs. At least there, lawmakers have an argument. Article I gives Congress the power to "regulate commerce with foreign nations." Congress has frequently ceded that power to the president. Now it's having second thoughts. The tug between Congress and the president over who controls foreign policy has been going on since the nation's founding. When President George Washington declared neutrality in the war between France and its European neighbors in 1793, two of the Constitution's framers, James Madison and Alexander Hamilton, disagreed over whether Washington had that power. Madison insisted the power belonged to Congress, while Hamilton argued the decision was the president's. Trump is by no means the first president to seize control of diplomacy in a personal way. In 1972, President Richard Nixon shocked the establishment with a surprise visit to Communist China, a dramatic first step toward opening diplomatic relations between the rival powers. And who can forget President Ronald Reagan's personal dealings with Mikhail Gorbachev, which contributed to ending the Cold War? Face it, Trump's personal diplomacy is controversial because he's controversial. But look beyond his swagger and judge the results.